What’s not to Love? These little beauties are almost too pretty to eat...but we managed! KAREN HOCHMAN is the Editorial Director of THE NIBBLE. Nothing brightens up her day more than a box of sunny chocolate. If all the chocolates were invited to a beauty pageant, it would take a hard-hearted panel not to include Norman Love’s pretty ganaches among the finalists. As you can see from their “glossies,” these girls are lookers. That’s no surprise when Dad is the former corporate pastry chef for Ritz Carlton’s global operations and a medallist at the World Cup of Pastry (Le Coup du Monde de la Patisserie). Chef Love is no stranger to the exacting high standards of the Sweet Arts. 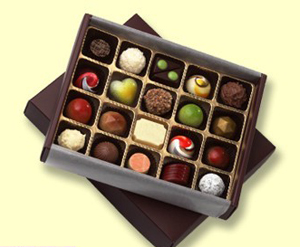 Using only the finest chocolate, butter, spices, nuts, purees and flavors—no artificial ingredients or preservatives—Love and his team of artisans create petite bonbons and truffles in thirty different flavors. Yes, petite: these beauty contestants are one-inch truffles, not statuesque two-inch gals. 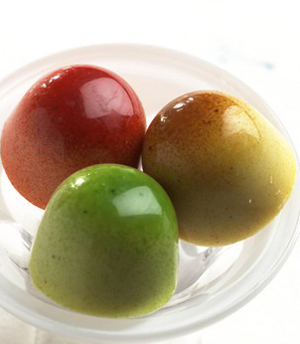 Norman Love believes that bonbons should be a taste, not a wallop. This is not a box of chocolates to wolf down, but one to savor delicately, a piece here, a piece there. Enjoy the art, while you’re slowly savoring. While other chocolatiers do nice design work with cocoa butter transfers and an occasional air brush or painted piece, most pieces in the Love collection are hand-painted or airbrushed into each chocolate mold—a painstaking process, but with a beautiful payoff. You have to go far to find prettier contenders. Photo at right: white chocolate made of Venezuelan Criollo beans houses a trio of ganaches: Granny Smith Apple, Banana Peanut Butter, and Roasted Pineapple with Tahitian Vanilla. Depending on the chocolate—white, milk, or dark—Love uses couverture from Belgium, France or Switzerland, filling his protégés with fresh fruit purees like lime, passionfruit, raspberry, apple, banana and pineapple...spices like vanilla rum, cinnamon, five spice...modern notes like academia, key lime, piña colada, white mocha, and pumpkin, and traditionals like praline, pistachio and Tahitian caramel. There’s even a cute grouping of sweets-within-sweets, with names like like pot de crème, pecan pie, cookies and cream, crème caramel, peanut butter and jelly and peanut butter and banana. 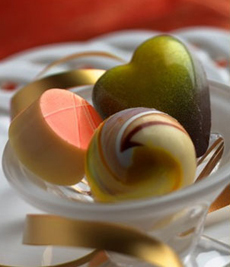 For all of the variety, Love prefers his flavors, like his bonbons, delicate. So, get out the demitasse cups, put on some classical music, and decide which one, or maybe two, you’ll eat today. Restrain yourself: this is art. The 30-piece box of chocolate. *Prices and product availability are verified at publication but are subject to change. Shipping is additional. These items are offered by a third party and THE NIBBLE has no relationship with them. This link to purchase is provided as a reader convenience.